Ever since I got an iPad, I've been collecting iPad covers. At first I needed one just to keep the front protected and to help prop it up. Then I wanted to bring it to a conference and wanted a keyboard. The list kept going. Here are four iPad covers I own and am reviewing, and I have some below that I'm giving away. Rules at the bottom. This Aduro Facio case with bluetooth removable keyboard is what I got when I was heading out to a conference. This was a blogging conference, where everybody had multiple devices and they were checking Facebook, Twitter, email and lord knows what else, at all times of the day. So the fact that my iPad cover and keyboard got so much attention says something. The keyboard is detachable (as you can see) and it fits on magnetically as well. The keyboard is a good size - not too small. When charged, it goes for something like 120 hours without needing recharging. I haven't recharged mine yet. I love it. It comes in several color combinations - mine is red and grey. It's not too heavy. sent me one to test out, and two to give away. 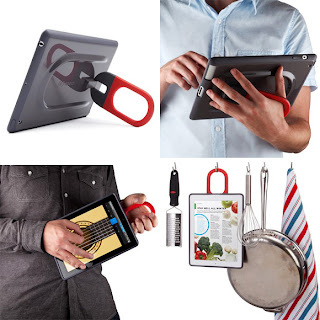 I was interested when I saw how you can use the hook on the back to hang up the iPad, like if you're cooking in the kitchen (or watching videos in the office - hanging it from the shutters or a hook). The hook also props it up, which is nice when you're using it at the table. You can use it as a grip when you're carrying it around the house, and use your other hand to tap on the iPad. This will be perfect for when my kids use it, because they've dropped it before in other cases. I think this will be safer. Watch the short video below for more. And contest rules for winning an Speck Handy Shell cover are at the bottom. 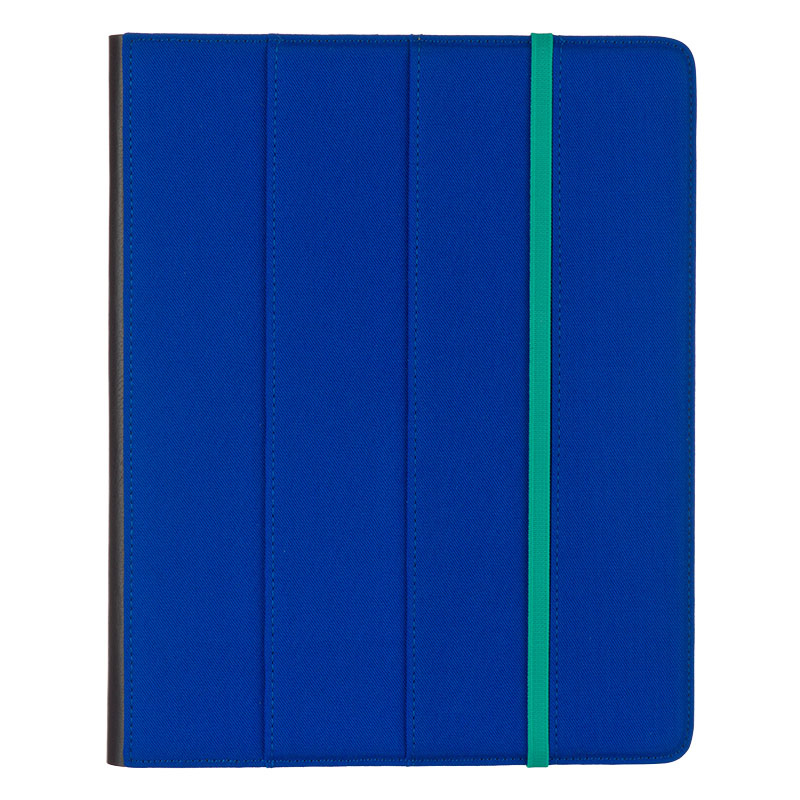 The M-Edge is the first iPad cover I got and I still use it frequently. 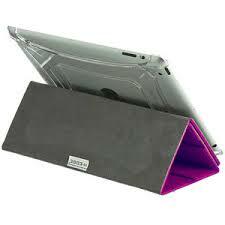 The flap on top covers the iPad and makes it less vulnerable to scratches if you stick it in your bag. The elastic keeps the cover on. You can prop it open and use the flap to hold it up (see second photo). Apparently you can rotate the iPad to hold it up vertically as well - I haven't tried that yet. My mom gave me this $4 iPad sleeve. My son likes it because he doesn't like playing on the iPad while it's in a holder, and this one he can just take it out. There are tons of places to buy generic iPad holders - including cute ones on Etsy. This one is great as just a regular cover and cushion, though I'm happy enough with my other ones that I would not have bought this one myself. 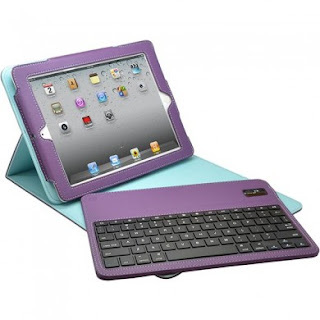 If you have an iPad 2 or the 3rd generation, the Speck Handy Shell in the contest will fit your iPad. To win, leave a comment to let me know your favorite uses for the iPad. We'll pick two winners using the random number generator on Friday, August 16 at 3:00 PST. You'll need to provide your email address so we can contact you to get your address. If you don't respond within 24 hours, we'll move on to the next person who came up on the random number generator. I love using skype on my ipad to stay in touch with my friends and family that are far away! and i love being able to stream movies & tv shows on it! so convenient!! I use my iPad 2 to play Words With Friends (including you), to check Facebook and email too. I use my iPad 2 for everything from work, Face Time for grandparents and grandchildren, Facebook, movies, short-term entertainment for my daughter, eBooks, an alarm clock - just about anything I can! I use my iPad to play educational games with my kids.